新年快乐! This Friday, January 31, 2013, is Chinese New Year. It’s also known as Spring Festival. It marks the start of the year of the horse. I have the great distinction of being born in the year of the rat. During this time of year, it is customary to eat longevity noodles, jiaozi, and fish, among other things. I recently learned why it is appropriate to serve fish this time of year. The Chinese word for fish is yu (魚), while the word for plentiful or abundance is yu (余). The Chinese phrase “may you have surplus every year” (Nian nian you yu) sounds like “may you have fish every year.” Given this introduction, you might think I would share a recipe for fish. 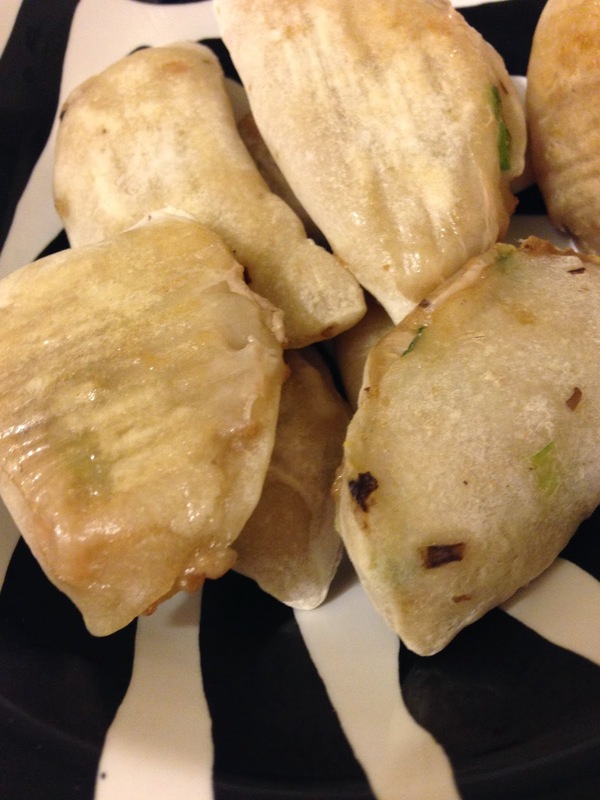 A family will eat jiao zi after midnight on New Year’s Day. There is an entire story about why, and I’ll share the link. Chinese New Year is a special occasion, so buy a new pair of cloths, clean your home, give out money in red envelops, paste an upside down 福 on your door, and make these jiao zi. This recipe is my version of a recipe I found on line. The ingredients for the dough are 3 cups all-purpose flour,1 cup cold water, and 1/4 teaspoon salt. The recipe said to use up to 1 ¼ cups of water, but I only used one. I wasn’t crazy about the dough. 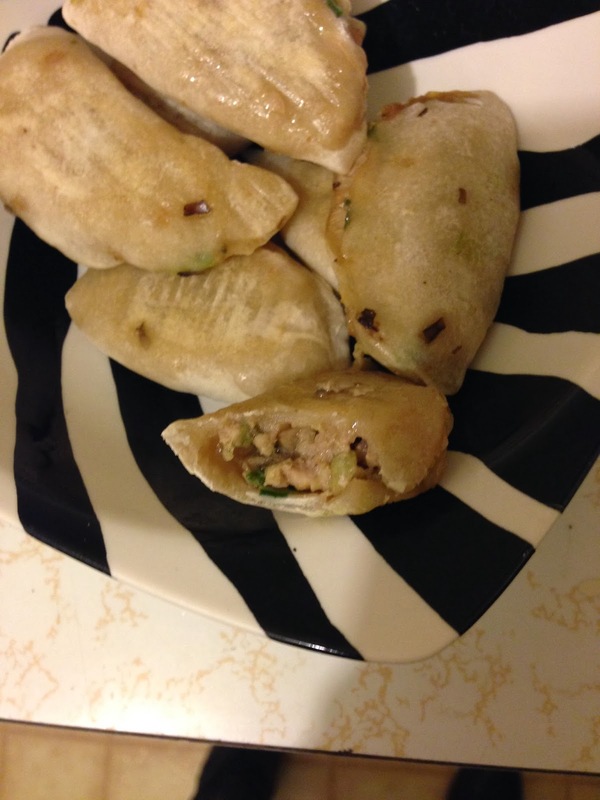 I suggest using another recipe or premade jiao zi wrappers. I would have bough wrappers, but Whole Foods only had wonton wrappers, and I don’t think those are the same. The ingredients for the filling are 1 cup ground pork, 1TB soy sauce, 2 teaspoons fish sauce, 1 teaspoon salt, 1 TB white rice vinger, 3 TB sesame oil, ½ minced green onion, 1 cup finely shredded leak, ½ cup minced mushrooms, 1 teaspoon minced fresh ginger, and 1 clove minced garlic. After I shredded the leak, I squeezed out as much liquid as I could with my hands. I began by making the dough. I stirred the salt and flour together. I slowly added cold water until the dough began to stick together. I kneaded the dough into a smooth ball. I let this rest while I prepared the filling. For the filling, I added the soy sauce, salt, rice vinegar, and fish sauce to the meat. The recipe said to stir in only one direction. I have no idea why that would be necessary, and I didn’t do it. I added the remaining ingredients. By this time the dough had rested for at least 30 minutes. I divided the dough into little pieces. The recipe said to divide the dough into 60 pieces. I’m not sure I had 60, but it was close. I rolled each piece out into a circle. The circles were supposed to be 3-inches in diameter. I placed a small amount of the filling into the middle of each wrapper. I folded the dough over the filling and pinched the edges together. The recipe directs you to wet the edges of the dumpling with water. I didn’t do that, but I should have. The first batch I cooked, I boiled them. This is the way I generally prepare jiao zi. I placed them in a pot with water and brought the water to boil. The recipe said to add 1/2 cup of cold water, and bring the water to boil again. Repeat this a third time. I wasn’t pleased with the results after boiling them. The outside was squishy and slimy. Jiao zi are usually slippery, but I wasn’t crazy about the texture. The second batch I baked for 13 minutes at 350 degrees. This method is very untraditional, especially given most Chinese people don’t have ovens. I liked the texture more. 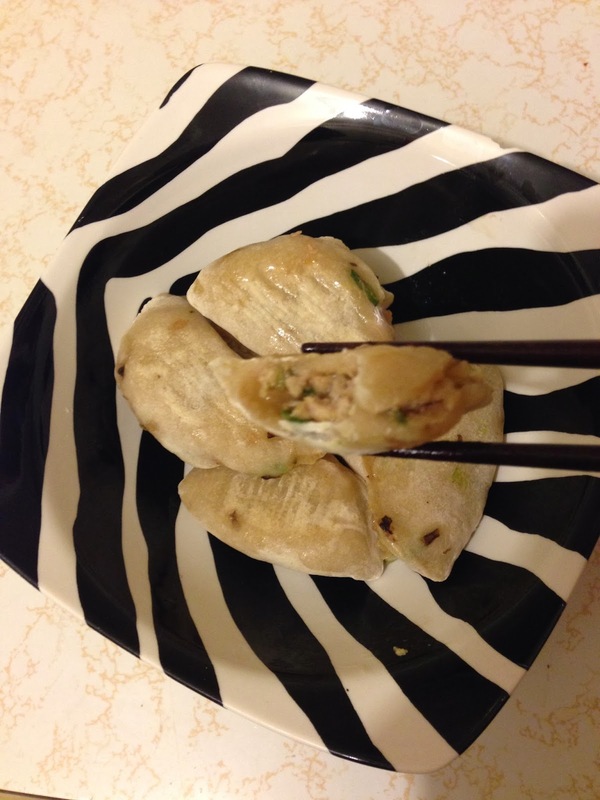 When I make jiao zi again, I’ll use store bought wrappers and boil them. Even though the dough was a bust, the filling was fragrant and succulent. 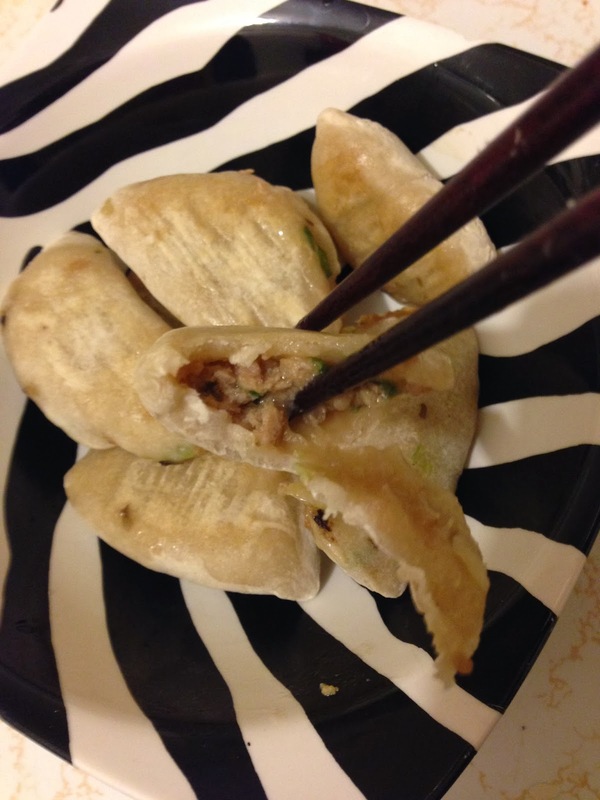 This definitely isn’t my last time making pork jiao zi. I need to work on my folding technique, but these were fun to make. They were delicious too! Hi, Laura. Thanks for stopping by my blog. Love this recipe. Great step-by-step pics. Going to try it this w/end w chicken! My foodie giveaway is open til this Sat. To enter, like my FB page and/or leave a comment on my salmon post. Wish you luck! I love that you made dumplings from scratch! these look perfect!